In round 1 of the Western Conference bracket, the Phoenix Suns Dancers are taking on the Oklahoma City Thunder Dancers in a match-up that I figured would be a landslide, but am looking so far like an idiot. Who would have thought the Thunder Dancers would be dominating like this? 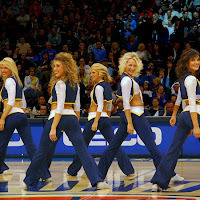 As I'm typing this, the current voting percentages have the Thunder Dancers in a blowout with 78% of the vote. Damn. So you tell me, who deserves to win this battle? And if you get there in time, make sure to head over to NBA.com for voting!